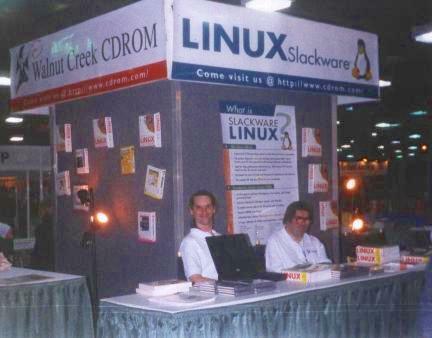 I've been going to comdex and volunteering some time at the booths in the Linux pavilion for the last 3 years, and it's been interesting to see the evolution of the booths, and the people that showed up there over the last three years. This year has been most interesting because by doing the whole comdex show, like the previous years, it wasn't difficult to notice that it was noticably smaller this year (Unlike last year when the Hilton had a couple of showrooms and there were a couple of huge tents which contained even more exhibits that just wouldn't fit anywhere else, those places were empty this year). 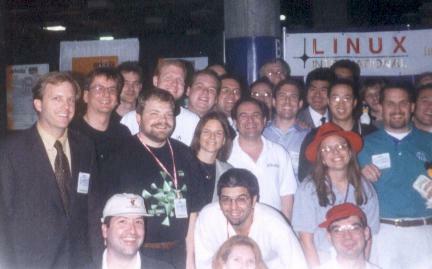 I was told that many companies went on a comdex diet this year, by not even showing up, or by having much smaller/less impressive booths (it seems that with the Asian stock crisis, companies have had to watch their expenses in order to salvage their stock). 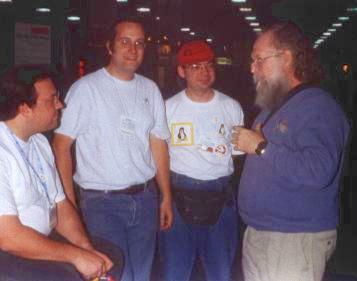 In 1994, Bob Young, then of ACC Bookstores, Michael Johnston, Patrick Volkerding and Mark Bolzern of WGS (WorkGroup Solutions)shared a Comdex booth. 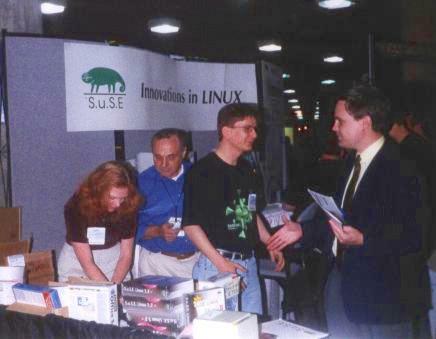 It was there that Mark came up with the "Linux Pavilion at Comdex" concept. 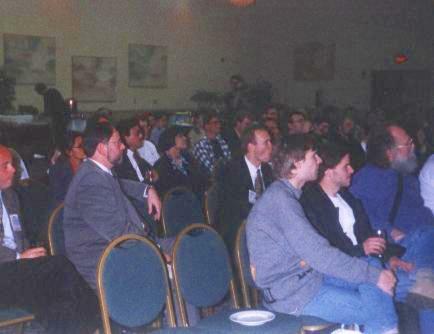 It was first implemented at the following Uniforum95, where Linux Journal, and Infomagic joined in. 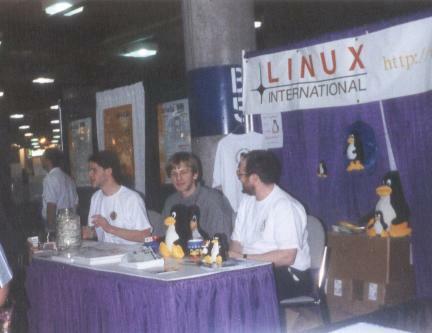 Mark then convinced Comdex show management to let him put together the first Comdex Linux Pavilion in Fall/1995 with 3 vendors, WGS, Microway, and also the booth for Linux International which Linux Journal helped to staff, and Mark paid expenses for. 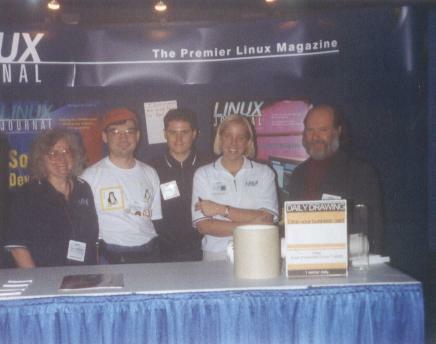 At this Comdex, WGS received a "Best of Comdex" Byte Magazine Editor's choice award for Linux Pro. 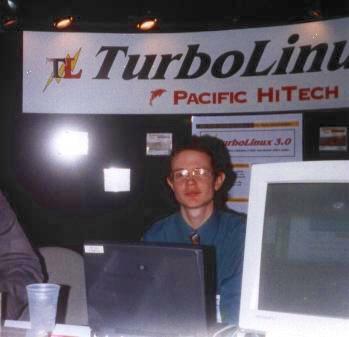 Mark then proceeded to coordinate the following two years. 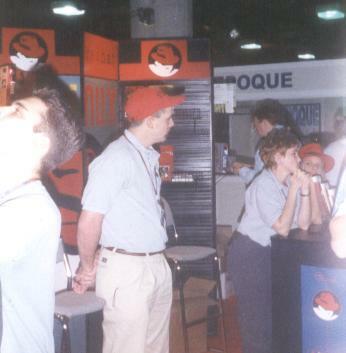 It was difficult to get vendors to cooperate at first (this is all pre-Maddog!). 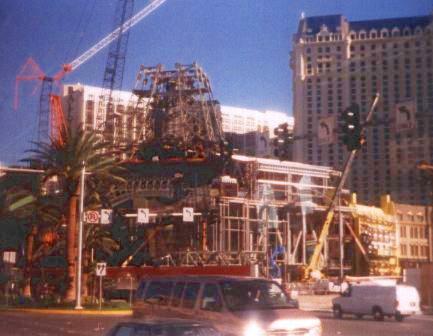 The Pavilion has approximately doubled in size every year. 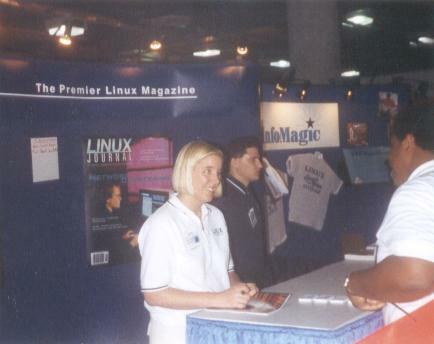 Now vendors love it and more want in every year. 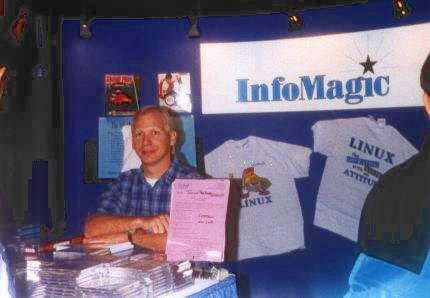 Of course, the Infomagic booth was there, like every year. They have all the CDs you could dream of . 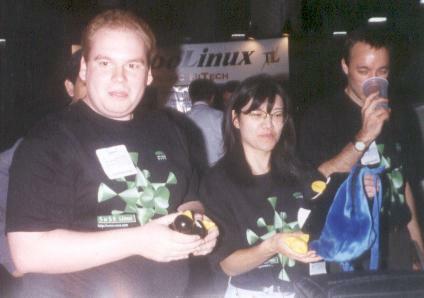 Of course, they are also famous for their linux 6 CD set featuring all the major distributions. 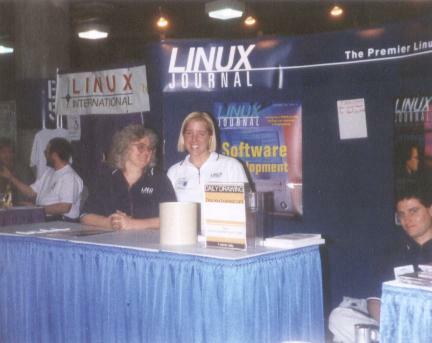 What would a linux show be without linux journal? 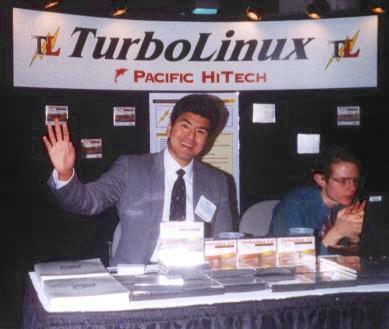 Pacific HiTech, with their new distribution: turbolinux (it's a fork of an older redhat version). 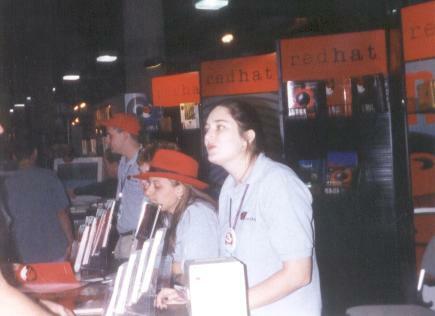 RedHat of course was there. It's been interesting to see them grow in the last three years. Two years ago, I was able to help them in their booth to answer questions. However, they have more than enough people to handle the crowd themselves now. 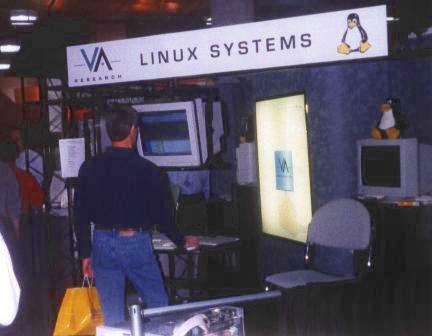 V.A. 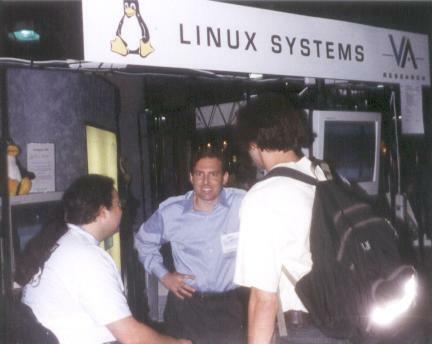 Research was also there, they build linux servers. 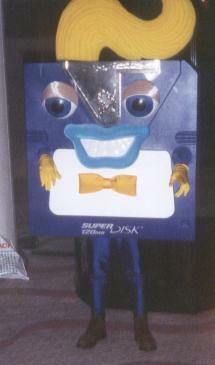 Someone got Don Marti (on the left) to put a suit and tie, and go help at the V.A. 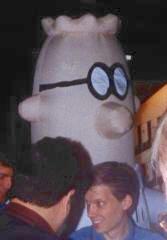 booth. 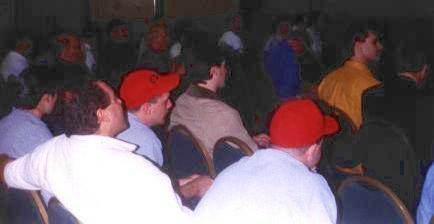 On the right is SVLUG's vice president, Chris Dibona enjoying his new job at V.A. 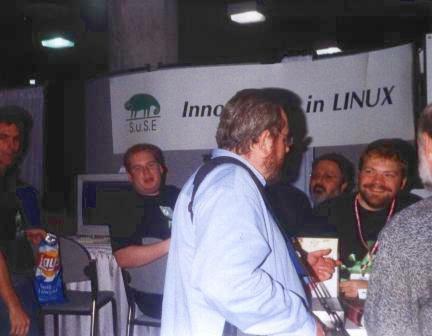 The other volunteers and I helped to answer questions about linux, and hand out linux CDs. Of course, the L.I. 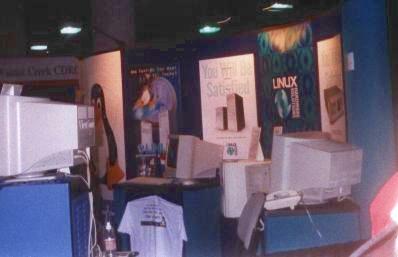 booth, just as L.I. 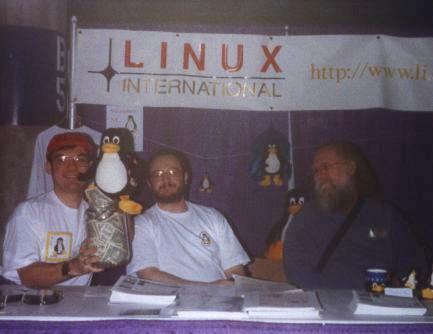 itself wouldn't exist without people like Jon "maddog" and Mark Bolzern from Linuxmall. 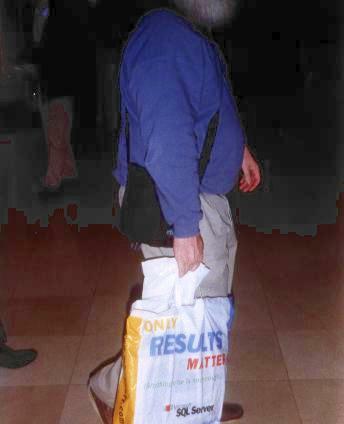 In addition to voluntering his time to the L.I. 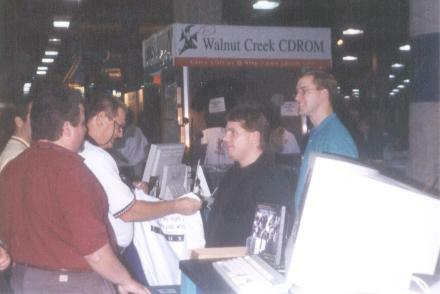 booth, Mark pitched in several thousand CDs of older releases of the major distributions. 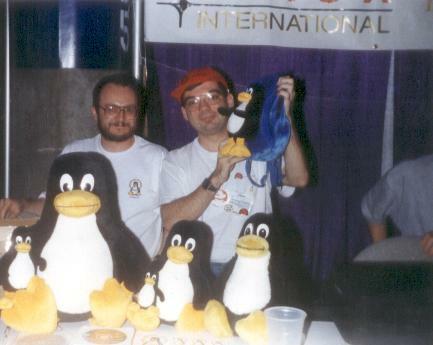 He also brought many sheets of linux stickers (they look like this in case you are wondering). I just learned from Mark that the money added up to $3700 which will all go to L.I. Thank you to Suse, Caldera, the other who contributed, and especially Mark for pitching in CDs and making this donation possible. 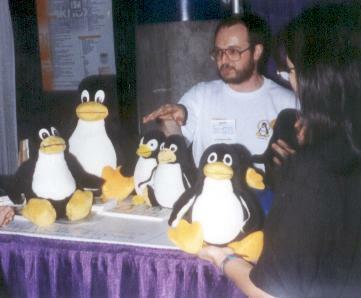 Before you ask: some of those penguins are for sale at linuxmall, but the biggest one, as well as the backpack are not for sale yet, but let them know how much you'd be willing to pay for those items, and they may commercialize them. 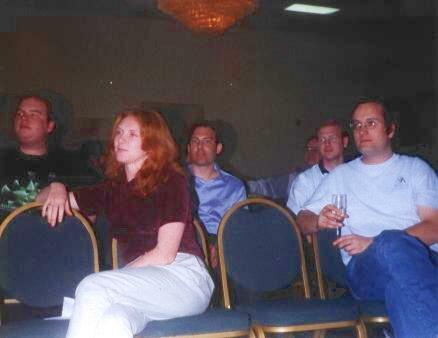 On wednesday evening, when we heard the good news about the new QT license, so we celebrated the end of desktop wars. 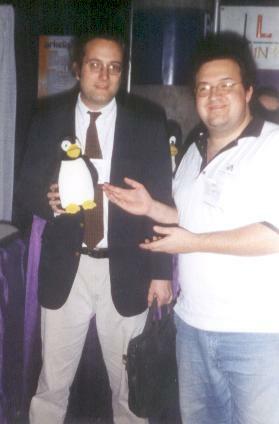 On that same wednesday evening took place the Linux Journal Editor's Choice Awards at the Alexis Park Resort in Las Vegas. 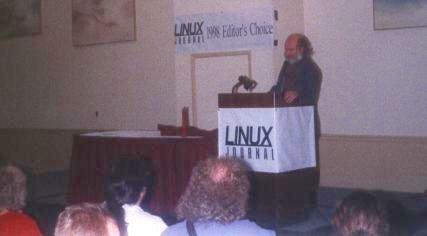 Seven awards were presented at this year's Linux Journal Editor's Choice Awards Reception. 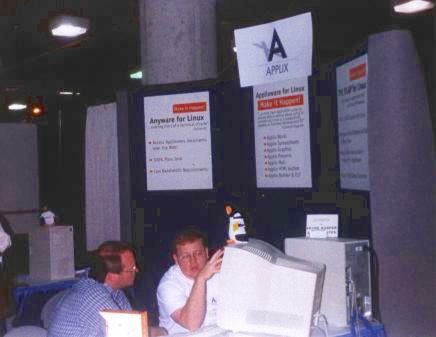 Most Desired Port: Quark's QuarkXpress. Best New Gadget: Schlumberger's Smart Card. Best New Hardware: Corel's NetWinder. 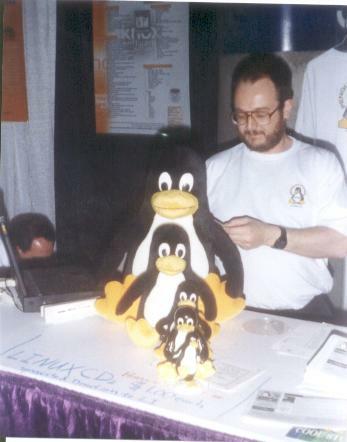 Best New Linux Application: Informix's Infomix SE. 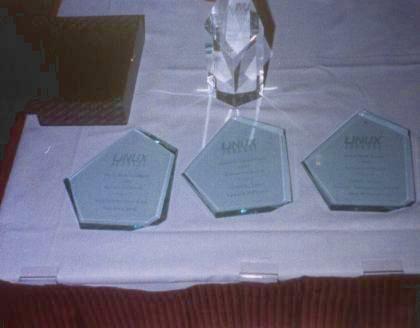 Best Business Solution: Cisco's print system. Best New Book: John Blair's SAMBA. 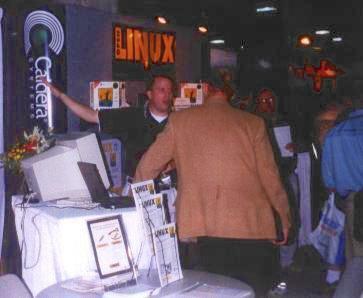 Product of the Year: Netscape's Communicator. and another one was able to very accurately follow a ball, go fetch it, and then kick it further. 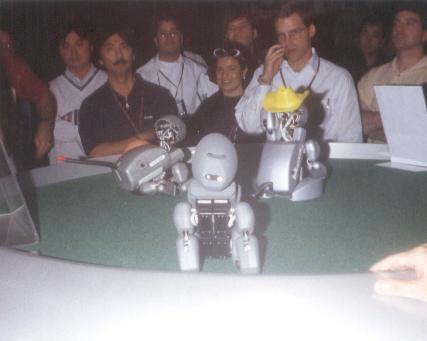 There is always cool stuff happening in Vegas. For instance, they like to blow stuff up and rebuild. 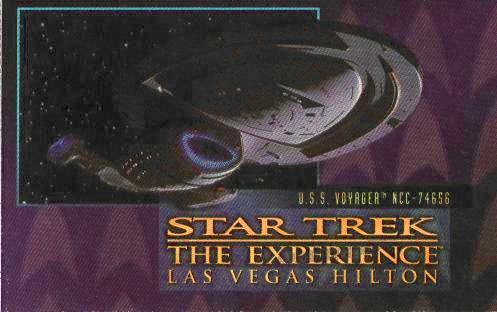 This year was also the first year than "Star Trek The Experience" was ready (they were still building it last year). 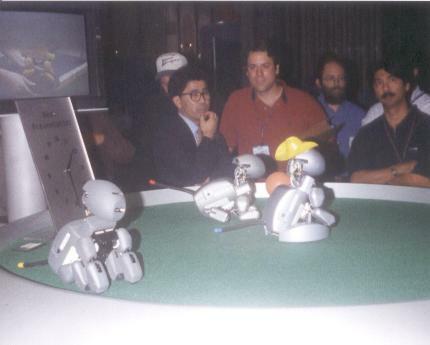 It's located in the Hilton, next to the Las Vegas Convention Center (LVCC). The have a Quark's bar/restaurant, and a the ticket gives you access to what is first a kind of museum with all the original Star Trek props, and a complete timeline of all the episodes and Star Trek movies, up to about last year's season. 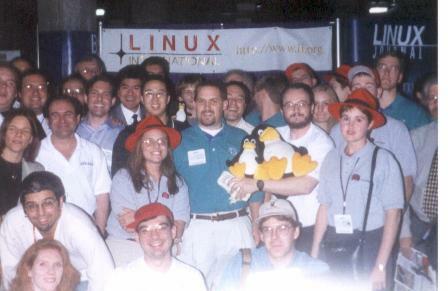 Just like the previous years, I had much fun going there, and enjoyed seeing all the linux folks from previous years. 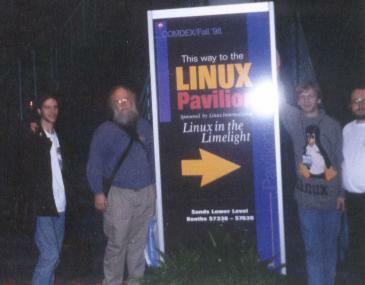 Those who didn't see the page may also enjoy the Linux revolt at the microsoft center in Palo Alto.